Numax Steels is one of the largest exporter, manufacturer and supplier of Carbon Steel Pipe and Tubes in India. 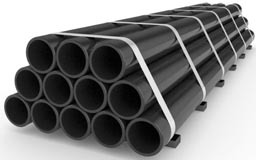 We are one of the prominent names engaged in offering Carbon Steel Pipes and Tubes. Offered products are developed as per industry laid quality norms and guidelines. These are widely used across various industries for different purposes. 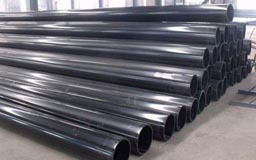 Carbon steel is a steel alloy consisting of iron and carbon. Several other elements are allowed in carbon steel, with low maximum percentages. They are manganese, with a 1.65% maximum, silicon, with a 0.60% maximum, and copper, with a 0.60% maximum. Other elements may be present in the steel in quantities too small to affect its properties. There are four types of carbon steel based on the amount of carbon in the alloy. Lower carbon steels are softer and more easily formed and steels with a higher carbon content are harder and stronger, but less ductile and harder to machine and weld. Low Carbon Steel :- Composition of 0.05%-0.25% carbon and up to 0.4% manganese. Also known as mild steel, it is a low cost material that is easy to shape. While not as hard as higher-carbon steels, its surface hardness can be increased by carburizing. Medium Carbon Steel:- Composition of 0.29%-0.54% carbon with 0.60%-1.65% manganese. Medium carbon steel is ductile and strong with good wear properties. 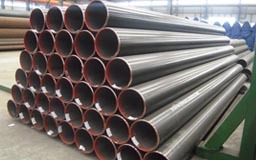 High Carbon Steel :- Composition of 0.55%-0.95% carbon with 0.30%-0.90% manganese. It is very strong and holds shape memory well, making it ideal for springs and wire. Very High Carbon Steel :- Composition of 0.96%-2.1% carbon. Its high carbon content makes it an extremely strong material, though it is brittle and requires special handling. ASTM A/ASME SA 106 GR A,B & C.
Qatar, Yaoundé, Accra, Vietnam, Khartoum, Egypt, New Zealand, Sudan, Democratic Republic of the Congo, United States, Alexandria, Peru, Malaysia, New York, Oman, Algiers, Colombo, Houston, Mbuji-Mayi, Brazzaville, Nairobi, Algeria, Omdurman, Sri Lanka, Mexico, Africa, Australia, Lagos, Fez, Indonesia, Hong Kong, Pretoria, Tunisia, Rabat, Kolwezi, Port Harcourt, Russia, Mozambique, Brazil, Venezuela, Maiduguri, Cameroon, Giza, UK, Angola, Lubumbashi, South Africa, Germany, Bahrain, Argentina, Harare, Luanda, Uganda, Durban, Casablanca, Cairo, Israel, Antananarivo, Port Elizabeth, Kaduna, Colombia, Maputo, Dakar, Iraq, Ibadan, Nigeria, Johannesburg, Kampala, Tripoli, Abidjan, Bulawayo, Dubai, Iran, Benin, Kazakhstan, Singapore, Canada, Morocco, Jordan, Saudi Arabia, Azerbaijan, Bamako, Subra al-Haymah, Italy, London, Cape Town, Yemen, Zaria, Ethiopa, Freetown, Trinidad and Tobago, Conakry, UAE, Kano, Thailand (Bangkok), Mogadishu, Lebanon, Abu Dhabi, Ouagadougou, Douala, Kuwait, Chine, Turkey, Dar es Salaam, Soweto, Cyprus, Kinshasa, Addis Ababa, Ghana. Casablanca, Maiduguri, Rabat, Tripoli, Johannesburg, Soweto, Andhra Pradesh, Angola, Hyderabad, Baraut, Ghana, Benin, Lubumbashi, India, Miryalaguda, Chennai, Douala, Antananarivo, Mogadishu, Suryapet, Khartoum, Bamako, Buxar, Udgir, Cyprus, Algeria, Kaduna, Harare, Maharashtra, Addis Ababa, Mumbai, Oman, Maputo, Omdurman, Delhi, Qatar, Algiers, Mozambique, Durban, Abidjan, Manipur, Ballia, Morocco, Brazzaville, Zaria, Giza, Luanda, Muktsar, Cameroon, Kampala, Abu Dhabi, Bansberia, Dar es Salaam, Jaipur, Bundi, New York, Singapore, Mbuji-Mayi, Sadar, Cairo, Kinshasa, Port Harcourt, Ouagadougou, Hong Kong, Democratic Republic of the Congo, Fez, Karnataka, Benin, Yaoundé, Surat, Port Elizabeth, Jamalpur, Nairobi, Ibadan, Yemen, Dakar, Puducherry, Pune, Alexandria, Lebanon, Bhiwadi, Bangalore, Lagos, Mizoram, Kerala, Uganda, Colombo, Pretoria, Kolkata, Jordan, Cape Town, Subra al-Haymah, Kolwezi, Freetown, Ambala, Lucknow, Conakry, Bulawayo, Thailand (Bangkok), Accra, Tripura, Ethiopa, Venezuela, Ahmedabad, Betul, Tadepalligudem, Nagapattinam, Kano, Russia.